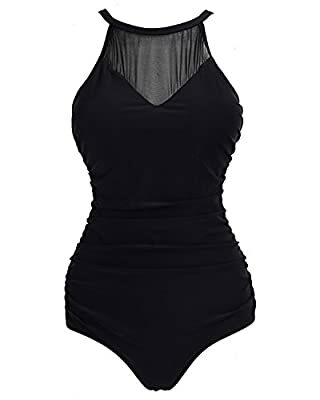 The swimsuit with unique mesh and deep v-neckline is perfect for chubby girls or young moms who'd like to cover flaws and show curves while catching some rays, modish and fantastic. The right swimsuit is not only functional but will also show your figure well, making you feel like the most gorgeous woman in the world. S(US 4-6):Bust 34"-35", Waist 26"-27", Hip 36.5"-37.5"
M(US 8-10):Bust 36"-37", Waist 28"-29", Hip 38.5"-39.5"
L(US 12-14):Bust 38.5"-40.5", Waist 30.5"-32", Hip 41"-42.5"
XL(US 16):Bust 41.5", Waist 33.5", Hip 44"
Hand wash in cold water, don't tumble dry, don't bleach, hang dry. Please measure your size carefully before purchase. As each computers displays colors differently, the color of the actual item may vary slightly from the above images. We strive to make our colors as accurate as possible. Adjustable shoulder straps are perfect for customized fit. Removable soft padded bra makes you feel comfortable. Front see through mesh and high neck design ultra chic, fashionable and flattering. Shirred retro swimwear conceals imperfections, hides belly, slims body. It makes you more confident and attractive. It is well made. The material is elastic, durable, soft and stretchy. Definitely providing you great wearing experience, cozy feeling. We have different US sizes for you to choose. S(US 4-6), M(US 8-10), L(US 12-14),XL(US 16). As for the details, please refer to the description part below.